Holiday traditions are a curious thing. Do you know how the Easter egg came to be associated with Easter? Early Christian Lenten practices were more strict. Abstaining from meat also included meat by-products. The Tuesday before Lent, Fat Tuesday, was a day that pantries were cleaned out of meat products. Chickens continued to lay eggs all of Lent. As Lenten is broken at Easter, there was an abundance of eggs from the chickens laying eggs that were not consumed during Lent. Thus, eggs were included in the food and fun of Easter celebrations. This year the boys and I decorated Easter eggs using food products around the house and objects we collected from the yard. 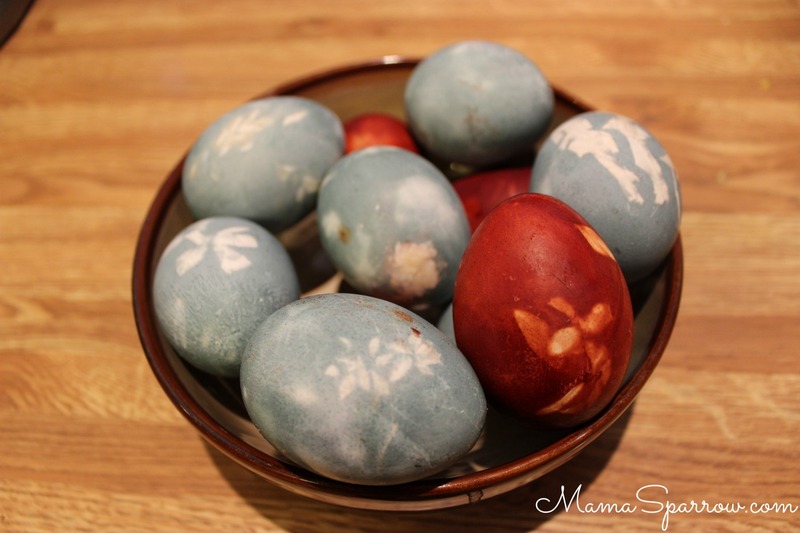 We wrapped eggs in old hosiery with random botanical objects picked in the yard. We boiled them in pots with onion skins and cabbage for color. Then we rested the wrapped eggs in the pots overnight. After 6 – 12 hours resting, the great unveiling of the eggs revealed beautifully colored eggs with surprise patterns from the objects they were wrapped with. If you haven’t tried dying eggs this way before, I would recommend it. The eggs came out in lovely earth colors. The onions skins created sepia tones and the cabbage made nice stone blue hues. I put together a recipe to guide your experience based on our learnings. Begin by boiling the coloring components in separate pots of water for 30-ish minutes to allow the color hues the deepen. While the pots are on, move on to getting eggs ready. while pots of coloring water boil. – small flowers, twigs, dried grasses from last season, etc. Cut the hosiery open to unwrap the eggs. Fish wrapped eggs out of coloring pots. Dab egg with lightly oiled rag or paper towel. Display your beautifully colored eggs! Cut hosiery into 3-5 inch length. Tie open ends leaving just one end open for inserting the eggs. Place items to use as patterns against the egg. Slip a piece of cut hosiery around the egg ensuring a snug fit. Secure by tying the open end. Place coloring components into stockpots with water just above what will cover an egg. Boil the water with coloring components for 30ish minutes. Allow the pots of colored water to cool. When the pots of colored water have cooled, stir in ¼ cup of vinegar. Tuck the eggs into the pots around the cabbage and onion skins, ensuring each eggs is fully submerged. Put the pots back onto high heat until they begin to boil. Reduce the heat to medium and boil for 10 minutes. Then turn the heat off, leaving the pots at their burners and covering. Allow the pots to cool. Once cool enough, place in the refrigerator for 6-12 hours. After cooling the eggs in the refrigerator, fish them out with tongs and cut the hosiery away from each egg. Dab the eggs with a lightly oiled rag or paper towel. In Green Living. Bookmark the permalink.